Our 'presents' are sure to enhance your celebration! Weddings take a lot of time and dedication to plan. Why not let us do some of the thinking for you. We offer a wide array of gifts and favors for your out-of-town guests, wedding party, and parents of the bride and groom. We work very closely with you and your event planner to insure that every 'i' is dotted and every 't' is crossed. You’ve been busy planning the venue, the caterer, the cake, the dress, the list goes and on and on. These are the big things, but it’s all about the little things. It’s the little extras that come at the tail end of the planning that are sometimes overlooked and decisions are made at the last minute. Your guests that travel to share in your special day are incurring quite a bit in extra cost, between the hotel, air fare, meals, rental car and so on. ~ Suggesting possible hotels, restaurants and attractions in the local area takes a lot of guesswork out of the equation. ~ A Welcome gift waiting for them in their hotel room. Show how much you appreciate them being there to share in your celebration. Having a gift basket/bag/box with lots of open and eat treats will make their stay more enjoyable. Since most of your guests are from other locations, we would like to suggest a ‘Welcome to Virginia’ basket filled with products native to the area, Virginia’s Finest. Be sure to include a Thank You note with and a possible itinerary of the wedding weekend. The bride and groom will receive a complementary honeymoon gift when placing your hotel gift basket order. ~ Invite them to the rehearsal dinner, a perfect way to meet the family and you will have a greater opportunity to hold more then a 5 minute conversation with them then at the wedding. ~ At the actual wedding, individually acknowledging out-of-town guests (as opposed to lumping everyone in generically) during the speeches are a great touch. One of the many things that people love about going to weddings are the favors that they receive. These tokens of appreciation are a reminder of the special time shared on your big day. 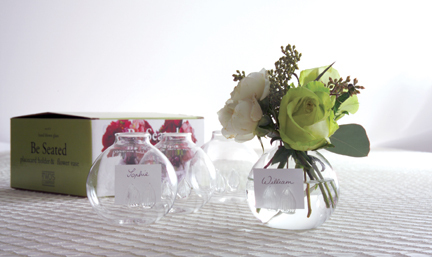 A great way to do this is to personalize your favors which makes them that much more special. Whether you choose place card holders, place card cookies, or a regional treat, the possibilities are endless and your ideas are welcome. We can personalize ribbons and labels. The bride and grooms names and date can be added to ribbons that can be tied to favors and or gifts. The most important lady of all! She has spent endless hours planning to make your big day perfect. Show her how special she is by customizing a gift basket Just for Mom. She has looked forward to this day all of your life so inquire about … ‘A Few of your Favorite Things’. You can find us on Wedding Wire!